We’re told that we spend too much time recording moments instead of living in them. That’s a false choice. 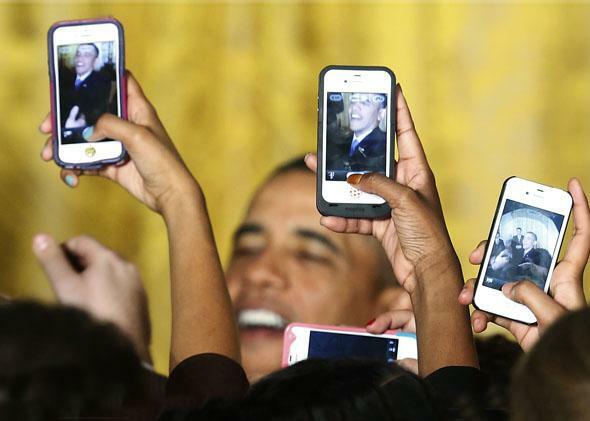 Attendees photograph President Obama with their mobile phones at a Women’s History Month reception at the White House on March 18, 2013. Some of my favorite memories and best ideas from last year are gone. I wrote them in a notebook I carried in my back pocket, and a few months ago, I left the notebook on a plane. Observations about my kids, story ideas, and thoughts about the world around me were lost. I replaced the notebook, and then last week, left the replacement notebook on a plane. This should win me some sort of prize. I have developed emergency relationships with the lost-and-found departments at Delta and United airlines, but you know how that story ends. You can find vintage sandwiches in the seat-back pouches of a plane, but if you leave a leather-bound notebook about the size of a 3-by-5 card behind, they’ll throw it in the engine and clam up before you get out of the airport. They have special drills for this, I think. 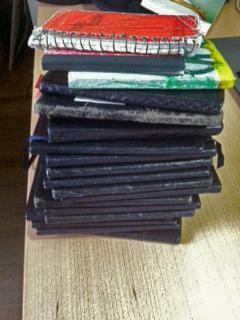 I have carried a notebook in my back pocket for the last 23 years, five months, and 11 days. I can be precise because I still have the first one and 20 others like it on a shelf in my office. They contain thousands of little passages, some only a sentence, from coffee shops and northbound trains and campaign buses. I’ve transcribed overheard conversations (“Shy sales people have skinny kids”), I’ve sketched characters for a novel (“he had the face of a dissipated potato”), and I’ve collected facts, words, and quotes from my travels and reading ("Democracy is the theory that the common people know what they want, and deserve to get it good and hard“). For years, not many other people shared my little habit. Now we all do it on Twitter, Facebook, and Instagram. Lately, there has been some concern about all of this activity. Last weekend in the New York Times, Sherry Turkle wrote about putting our lives “on pause” in order to tweet, text, or take a selfie: “When you get accustomed to a life of stops and starts, you get less accustomed to reflecting on where you are and what you are thinking.” A few months ago, also in the Times, Nick Bilton wrote that we’re all so busy capturing moments, we’re not living in them. This is a false choice. You can live in the moment and capture it. (Apple’s ubiquitous holiday ad made a version of this point and went viral.) I have the notebooks to prove it (most of them, anyway), and the proof is in how acutely I feel the loss of the two last seen in and around seats 8A and 11F. What I have lost is not just my observations of various moments—made more meaningful because I stopped to put them into words—but I’ve also lost the feelings and recollections those entries would have unlocked when I looked back over them. 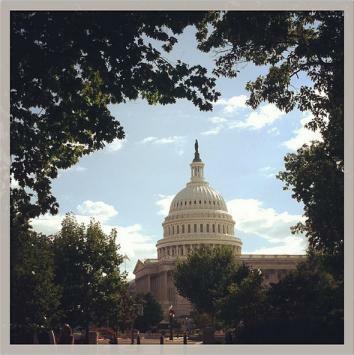 In recent years, I’ve captured more through my iPhone than my pen. As a practical matter, that means some of that writing I lost is in Twitter or on Facebook, but the technology offers more than just the cloud backup. It has improved this process of engaging with life through pausing to capture it. The unexamined life is not worth living, said Socrates (and every freshman taking philosophy), but he also said to beware of the barrenness of a busy life. There is a tension between the obsessiveness Turkle and Bilton write about and the enriching observations of the kind I fancy I have. We all know how to spot the obsessives. They’re blocking views at concerts as they hold up their phone to capture distant singing blobs of blurry light onstage. They text and drive, putting other people at risk, or they’re the ones at dinner who photograph every course change. These people are a chore, but people have been abusing the mouth by talking too much for ages. If you are tweeting and not paying attention to the world around you, then you’re just a bore. It’s not technology’s fault or a change in norms. If you go out to dinner with people who are constantly texting, it’s like going to dinner with people who won’t shut up about their golf game or their wireless speakers. It’s also true, though, that for some people, talking too much or taking a thousand photographs is the way they experience the world. They are not interested in your Zen moments. A life of frantic self-interruption may be their therapy. The result of the oversharing and digital busyness is that it makes those of us who worry about doing the right thing feel like we’re passing notes in church every time we stop to document. Don’t tweet or Instagram for fear that someone will think you’re not living in the moment. We’re all on the cusp of being boorish American tourists wherever we go. But this overstates the peril of a process that is fundamentally about engagement and mindfulness. When you pause to write about something—even if it’s for Twitter or Facebook—you are engaging with it. Something within you is inspired and, at the very least, you’ve got to pick the words and context to convey meaning for your private recollection or, if you make it public, for the larger world. “Only known photo of the white male patriarchy,” reads the caption to a photo I saw in Madame Dora’s, a thrift shop in Minneapolis, nine years ago. That would have made a better caption for Instagram, but the iPhone hadn’t even been invented yet. (I’m sure the clock I was going to save up for isn’t there anymore, either.) Photographs, and particularly selfies, get a lot of criticism for distracting us, but they are even more powerful passageways to meaning than the written word. Surprise fireworks at a wedding across the street. 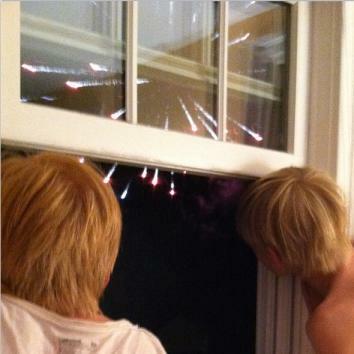 Here’s a picture of surprise fireworks that broke out across the street this summer. Taking the picture didn’t diminish the surprise; I’d already experienced that. But what I did capture was the kids rushing from their beds and all of us hovering around the window. I suppose there were a few moments lost to possible consideration of the larger role fireworks play in man’s winding path toward meaning, but the fireworks went on for a really long time, so I think I figured that out too. In the past, you took a photo, you hoped it developed, you relived the moment, and then entombed most of the pictures in a shoebox or a photo album. Now we carry those moments with us. The first time I played guitar with my daughter, I might not have been 100 percent in the moment when I made a video of it, but I don’t think I missed a chord, and when I’m stuck on a plane I’m very happy to hear her play. I am happy to swap the seconds I expended getting the video in place for the moments of escape the video provides from the middle-seat armrest competition. 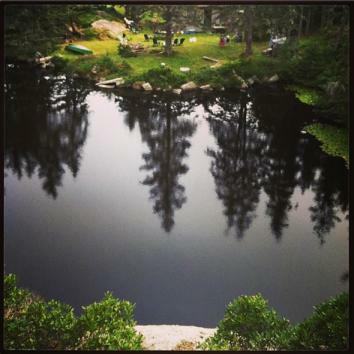 I wish I had a photograph of the place we ate sushi after I picked my daughter up from camp. There was nothing visually interesting about it, but the picture would remind me of hearing her tell me the benefits of taking risks in life. If you have children and want to give your future self a present, record their laughter as toddlers. When they’re older and away from you, you might find that clip in the middle of the day and it will transport you as surely as if you had a time machine. Now that we can all carry meaning with us, we are more alive to its appearance in daily life. I am always looking for material—whether for my notebooks or for Twitter or Instagram—which means I’m looking for meaning. Of course it’s my job to look for material (you’re experiencing that in this piece right now), but my guess is that other people start to get habituated to the process too. Their eyes are open in a new way, they capture something, like a view they like from a familiar walk, and instead of a fleeting moment, they have a richer moment of their experience to savor. One of the great things about children is that they have no other concern than to be simply interested in things. It is considered by some the height of mindfulness to approach the world afresh like a child. So perhaps we’ve got this all wrong. If we practice hard enough, we can become thoroughly interested in even the simplest things of daily life, the way a child would. The smallest things would become so meaningful, they might even be worthy a few words or a photograph, whatever method you use to capture them.